Terminology forever linked to software localization in the US? As stated in the call for participation, the TermNet Terminology Survey was developed for communication professionals who were either located in the United States or in Canada or worked for clients in these markets and who were somewhat familiar with terminology issues. The assumption was that language professionals would participate and share what is happening with regard to terminology issues. 145 people participated, and 81% went through all mandatory questions. Three quarters were doers, e.g. translators, project managers, content publishers or an individual contributor in another communication profession; the remainder was decision makers who managed teams and/or budget. 58% lived in the United States, 29% in Europe. The remaining 13% came from Canada, Asia or Latin America. Below is the statistics of countries where their customers are located. Not unexpectedly, the majority of participants work for the information and communication technology (ICT) sector. On the one hand, this data is slanted towards the ICT sector, because we invited many from our existing network, which is heavily biased towards software companies. 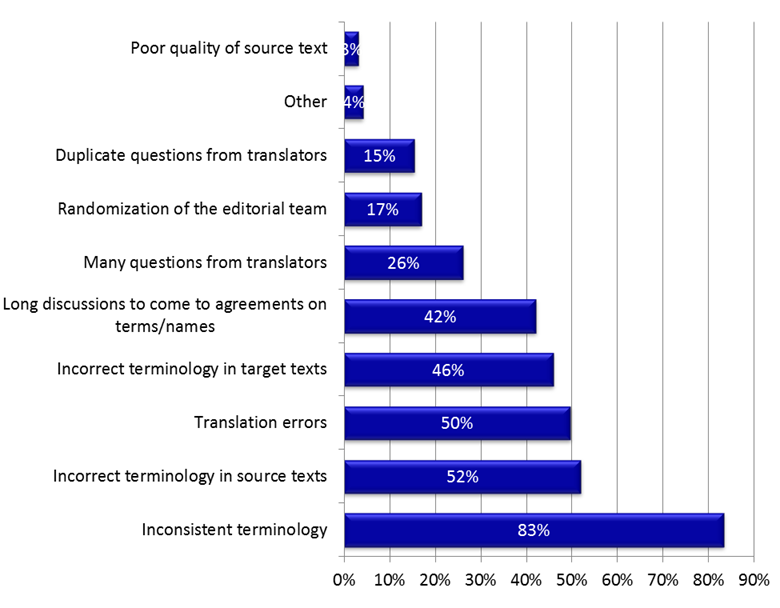 On the other hand, the term “terminology” seems to be intricately linked to “localization” in the United States: When we announced the survey to people from other industries as “a survey on communication and terminology issues,” some responded that they were not in “localization,” others, e.g. in the high-tech sector, stated that it had nothing to do with their field. When asked “what kind of issues are consuming your time?” Inconsistent terminology turned out the biggest issue. An open-ended question on causes for documentation problems brought out the fact that time-to-market is so short in the software industry: People felt that they work under high “time pressure” with “unrealistic turnaround times.” There are “large volumes of source content […] that [clients] have a hard time managing.” And at the same time, there is “[c]onstant evolution of the product.” While people did not see terminology management as a way to speed things up, they clearly saw terminology management as a solution whether they were already engaged in it or not. So, localizers and content publishers in the ICT sector are ‘believers?’ First of all, do you agree? And secondly, why do you think it is harder to talk about terminology issues to people who are not in localization or who work for other industries? Thank you for participating in the TermNet Terminology Survey! The results are in. If you participated and signed up to get a summary of the results, you should have received them this week. If you signed up, but didn’t receive them, feel free to send me an e-mail. We also have a winner of the prize drawing. Petr from Prague will receive free tuition at the Terminology Summer School in Cologne, July 11 – 15. More information about this event is forthcoming on the TermNet website. To get an idea about the event, click on the image. And for more information on the survey results, check back here. What is happening or not happening on the North American market? And what do people in the content supply chain identify as the biggest communication problem? With a focus on terminology, of course. These are the goals, among others, of a survey commissioned by the International Network of Terminology (TermNet). The survey targets communication professionals, such as translators, terminologists, content publishers, branding and marketing experts on the one hand side and project managers as well as decision makers on the other. They can be located anywhere along the content supply chain—in a company, at a language service provider or on the freelance market. But they should be working in or for the North American market. The survey is focused on several different industries, but not limited to the ones called out specifically. lease participate in the survey and invite all your colleagues and managers! It should take no more than 15 min. You can opt in at the end to receive results and participate in a prize drawing. Click on the TermNet logo to begin.